Bold Visionary or Persona Non Grata? Last weekend's leak of an internal memo from Brad Garlinghouse, VP Communications Products at Yahoo! (Garlinghouse oversees Mail, Photos, Community, etc) sheds light on one of the more interesting conundrums of the executive suite: at what point does an exec stick his/her own neck out to challenge the status quo? Moreover, will capturing the bully pulpit isolate your views and alienate colleagues? Will it create real change or be received as mere office politics? Too often leaders in the executive suite, especially in relatively mature companies, get so wrapped up in defending "what is" as opposed to engaging in creative destruction to build "what might be". It is this fact that makes Garlinghouse's "Peanut Butter Manifesto" so striking as it is so rare to see this kind of open challenge to the status quo. The memo is remarkable if for nothing else in its willingness to be rejected. While the Machiavellian among us may dismiss Garlinghouse's memo as a stunt designed to embarrass superiors and position himself for higher leadership position at Yahoo!, one must also consider the possibility that this memo was written with a pure intent. After all Garlinghouse has a long track record as a loyal employee and has demonstrated an enduring passion for Yahoo's products (to demonstrate his zeal for the company, Garlinghouse is reported to at one point shaved a "Y" into the back of his head). Having met Garlinghouse previously he presents himself as a well-balanced and thoughtful manager. Hardly the type that is taken to grandstanding merely for personal gains. So why do it? Maybe, just maybe, he really does care. About the employees, customers, colleagues and shareholders he serves. Maybe he cares so much that he is willing to set aside his self interest to challenge Yahoo's leadership to focus on doing a few things better than any one else rather than dip its toes in every online business imaginable. Maybe, by focusing on personalization, an area Yahoo! does better than most, maybe, just maybe Yahoo! can become the Web 3.0 company that few current players have the potential to aspire to. And, maybe his integrity as a leader has compelled him to say 'the Emperor has no clothes" when the rest of the flock is willing to go along, get along. My hope is that Brad's memo inspires real change at Yahoo! and in turn emboldens other leaders to speak out against convention. If this happens, maybe, just maybe, "integrity" won't become a flaccid platitude relegated to the corporate handbook, but will be the moral force behind bold actions execs call upon to avoid the ship from hitting the rocks. 2) Know your culture and bring it to life every day. Culture will be your competitive advantage. Figure out what your culture is: at Cranium there are two: 1) consumer sensitivity “CHIFF” (Creative, High Quality, Innovative, Friendly & Fun) and 2) operational excellence – the human pulse is used as a metaphor creating “PULSE” stations – key operational metrics eg: EBITDA Fever (“Saturday Night Fever” used as soundtrack) & Revenue Racetrack – giant games piece that moves big dollar bills around the office that show revenue performance. Celebrate milestones and touch tones – “bang the gong – launching a new website, hire an employee, shipping a new product. 3) Change the rules: At Cranium the rule change was: “Let’s take the games where our customers are instead of bringing customers to our games.” Cranium was the first game ever to be sold into Starbucks, Amazon (Cranium sales team scheduled "play dates" with the friends of the buyers at Amazon who then recommended Amazon should stock the game), and Barnes & Noble (grabbed two people at the water cooler outside the buyers office and played the game for 15 minutes with the buyer-- they were sold). Also, applaud people in your company who don’t take "no" for an answer. 4) Figure out what you are really, really, really good at and build the whole company around it: Cranium is good at 1) Invention and has “big ears” listening to feedback and customers and 2) Developing products that delivers on the emotional contract with customers. Cranium designed processes to develop products defined in a manner which are consistent with Cranium Culture - eg: Cranium Cuisinart (product brainstorming), Moment Engineering (product refinement), Big Ears (market research and product testing), Customer Celebration (customer feedback), CHIFF Check List (meet the CHIFF requirements for all products), Celebrate Shine (the moment when consumer enjoys the final game experience and recommends to friends). 6) Never forget that your customers are your sales force – the whole company has been built on Craniacs – word of mouth – eg: Cranium has prepped four "Cranium weddings" creating custom games that reflect the couples' history. Conviction to customers lets you make history. Not able to purchase a game locally in a rural area, Cranium hired a private plane and hand delivered a game to a customer just in time for her hustand's 40th birthday party – 6 years ago – she is still writing Christmas cards to the company and spreading the gospel of Cranium to everyone she meets. CEO recieves and reads over 200 customers emails per day. Over 29,000 Craniacs have written their own games. Never forget the power of your customers. 7) Build the company on anticipation rather than reaction “Orbiting the Giant Hairball” (also the title of a book by Gordon McKenzie - must reading for every Cranium employee). Teach yourself to be great at anticipation rather than reaction. Learn how to stay creative-- especially in a large organization. Extra Credit) Be a company with a heart and give back to the community – Cranium has given over $700K to Kids at Risk programs. These are rules which we can all live buy. It is only fitting that ad:Tech NY takes place immediately following the New York City marathon. Runners proudly brandish their medals from this year’s race are seen throughout the Hilton’s hotel lobby now competing for space with runners of a very different stripe – the internet marketing professional. These “runners” are here for a very different race. We are here scrambling from booth, to meeting, to seminar, to keynote, to coffee meeting, to cocktail lounge, to sponsor party, to keynote address in search of that illusive, but plainly apparent, finish line: the well placed contact or piece of intelligence that will catapult each attendee (and participating company) to ever greater revenues and marketshare—and yes, bragging rights for world dominance. Predictably, with the recent acquisition of YouTube and the growing market share of MySpace, much of the conversation from the speaker’s podium focused on video ontent powered by the now wide adoption of broadbrand. Video (and rich media content in general) is creating new opportunities to engage consumers and generate sales revenues for brand marketers and the ad sales infrastructure that supports them. To highlight this intersection of dependency and opportunity, Tuesday’s keynote panel presentation, “ The Online Video Revolution: A Marketer’s Dream or a Consumer Generated Mess?”, included execs from traditional media (CNN), new media (YouTube), agencies (Isobar) and infrastructure (Akamai). While not specifying the number of streams or downloads, YouTube CMO Suzy Reider, indicated her chief concern that “there is a coming glut of video inventory” from user generated content sites like YouTube (CNN also aggregates UGC via its iReport news channel) and foesaw “depression of prices in the year ahead.” She claimed YouTube was currently enjoying “CPMs in the $20 - $30 range”. Interesting to note that the ad sales organization at YouTube reports to the office of the CMO (Ms Reider’s background is in media sales at CNET and Ziff Davis). Sarah Fay from Isobar (whose agencies include Carat Fusion, Freestyle, Molecular & iProspect) commented that as a buyer the focus for metrics continues to be engagement and while standard metrics have yet to emerge (and remain somewhat elusive), but confirmed that advertisers are tracking values such as length of viewing as proxies for engagement. Advertisers also continue to fund development at interactive agencies visa vis measurement technologies and investments in media strategy and planning expertise. She cited her own company’s growth from just a few hundred employees in 2003 to over 1600 worldwide. Jupiter Research released its forecast for Internet ad spending in the US over the next 5 years. With consumers spending as much time online as watching TV the shift of dollars from offline media to online is expected to grow. Biggest investors in online advertising are projected to come from the following verticals: music, entertainment, financial services, travel and automotive. 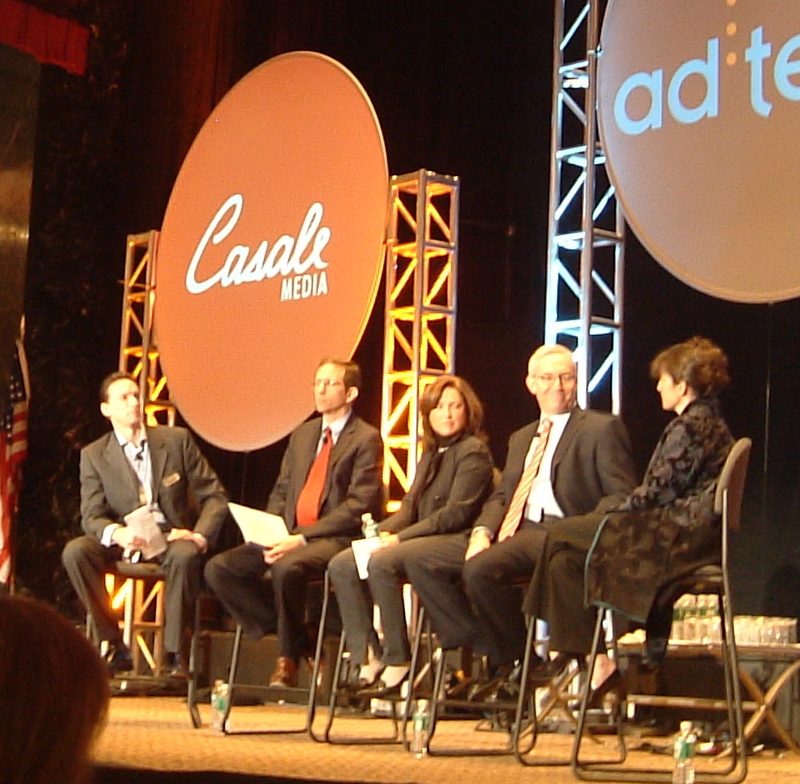 Mobile advertising was also a thread that was evident in both the sessions and the exhibitors. In the “Now & Next Tech Show” innovation pavilion, all of the emerging companies that were on display were focused on the mobile advertising space. Most were showcasing applications and content (gaming) that have advertising embedded. A number of analytics companies were also in evidence. Most of the action I witnessed was on the show floor itself. This year the exhibit space was spread over 3 full floors of the Hilton’s conference space. Over 10,000 attended the show cramming the aisles, coffee lines and conference rooms. While some complained about the unusually tight hallways and aisles, there were others who like the buzz and sense of urgency that having too many people buzzing about creates for the show. 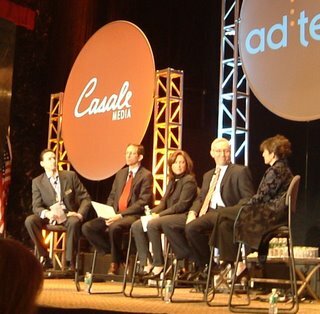 We’ll see what happens: ad:Tech completes their lease agreement with Hilton (ending in 2007) and will determine if the NY event will be moved to the Javits Center to better accommodate future increased attendance. Quantity does not equal Quality: While we were pleased in the growth in attendance (we saw our raw number of leads captured during the show shoot up 5 fold over 2005), ad:tech seems to be stuck in rut in not attracting visitors outside its core constituents of ad networks, affiliate marketers and service providers. Few if any actual direct advertisers or top interactive agency contacts were in attendance. Considering NY is the financial, media and advertising capital of North America (if not the world) it is perplexing to see so few actual advertisers in attendance.